Removable insulation covers for valves and flanges are an effective, convenient, and low cost solution to reduce heat loss and lower energy bills. The pipe and valve insulation line is designed to fit an array of fittings and sizes, and can be used on almost any application that requires thermal processing. UniTherm pipe and valve insulation jackets are the most effective and convenient way to prevent heat loss from valves, flanges, and other pipe components. Wrap ISOCOVER around pipe component. Tie drawstrings firmly. Use stainless steel wire to securely close ISOCOVER. Pipe and valve insulation in most buildings is generally well insulated. However in some sites there are pipe runs, mechanical fittings and valve bodies that are bare. When left bare, though, uninsulated valves and fittings can lose huge amounts of heat that can add significant costs to the energy bill and create unnecessary health and safety issues. This can be avoided by simply installing insulation on the uninsulated or under-insulated valves and fittings. Every uninsulated valve, flange, and fitting is costing you money every single day. Insulating a single 6” gate valve adds $525 back to your bottom line every single year. Thoughtful design means jackets stay on the equipment where they continue to save money. UniTherm designs insulation jackets with draw cords and hook and loop material flaps rather than hook and wire closures. This makes them easy to install, remove, and reinstall with no tools and no assistance. Personnel can easily access equipment for maintenance and reinstall the jacket in a matter of seconds. OSHA requires that heated surfaces be no more than 120°F for employee safety. UniTherm insulation jackets easily reduce surface temperatures to meet this requirement. 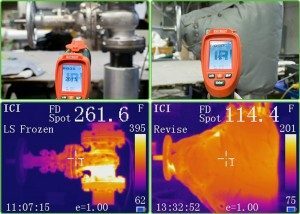 For example, a valve operating at 350°F will have a surface temperature of 93°F with an insulation jacket installed. Safety is about more than meeting OSHA requirements; employees deserve to work in an environment that is safe from the risk of burns. 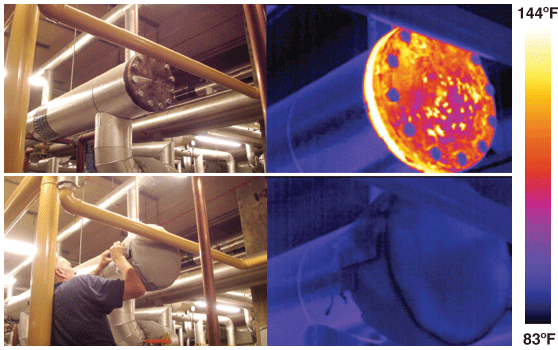 Q: Why should I use UniTherm’s removable/reusable pipe and valve insulation products, instead of permanent insulation? A: UniTherm designs insulation jackets with draw cords and a quick fastening system, which makes the removal and installation process significantly easier for routine or periodic maintenance inspections. Q: My mechanical/boiler room is very hot. If I insulate my piping components will it lower the ambient temperature in my facility? A: Yes. Over the years, a variety of people who have installed and used our products in their facilities, notice an immediate and significant drop in temperature. Q: I do not know where to start when it comes to ordering removable/reusable pipe component insulation? A: UniTherm has a unique, standardized line of removable/reusable pipe component insulation products, which have been designed to fit a wide range of shapes and sizes. We have an extensive line of custom and standard products to accommodate a variety of applications. Visit our online shopping cart located at the top of our page, to learn more about our standard product lines.